Employees and customers must be able to access applications and data from multiple devices and locations, without compromising security. Companies across the industry sectors are looking to digital initiatives to make the difference for them. For the majority, the customer is a key driver behind their desire for digital transformation. Many new projects aim to improve the customer experience in order to raise engagement, or boost the efficiency of customer service and responses. These are the top goals companies have for their digital business initiatives, according to research. Businesses are also transforming their processes to maintain competitiveness, generate new revenue, and strengthen their security. Of course, digital transformation isn’t a new concept. It began with the first emails and early business websites. But a lot of the early digital business initiatives centred on moving away from paper-based processes and using digital to streamline operations. 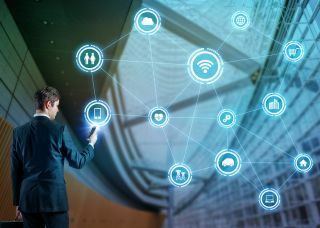 What’s new is the multiplicity of connected devices that contribute to the digital mesh that underpins today’s businesses; and the high digital expectations of both customers and employees. For example, customers expect to be able to use multiple devices - their tablet, smartphone, PC or even a gaming console - to shop or connect with your business. They also want to communicate with you through email, text, voice, video, social media and the web; and log into their apps and accounts via multiple channels, including social media identities. On top of all this, emerging technologies such as wearable computers and Internet of Things devices - smart, connected equipment like thermostats and car dashboards - are entering the mix. It’s great for businesses because all of these connected devices continually generate valuable data that tells you all about your customers’ demographics, preferences, dislikes and behaviour. They give you a detailed picture of their identity. Consequently, identity is emerging as the cornerstone of digital transformation. Without having it at the core, your business misses out on the ability to understand and serve your customers well, or get the best from your customer relationships. The issue of identity is so important that 91% of IT managers now consider identity management as a key enabler for digital business initiatives - almost half seeing it as critical. The main reason for this is that businesses have undergone a profound shift away from merely selling products and services to listening more closely to what the customer actually wants, and then delivering it. It’s in line with the old maxim: a happy customer is a loyal customer. So, what do you gain by putting identity at the heart of your business? Well, customer retention and loyalty is high up on the list, which comes as a result of improved customer service and the ability to predict customer behaviour and needs. To retain customers in a digital world, multichannel customer recognition is essential if you want to provide a frictionless and relevant online and offline experience. Identity is central to this because it gives you a single customer view, providing unrivalled insight into their behaviour. This means you can segment them, and target and optimise offers for specific customers in their preferred channels. The most important thing is that identity starts with reducing friction, making it easy for people to sign in, making it easy for people to transact. Everyone is trying to bridge that gap between physical and digital. You need an identity solution that allows you to do that; once this is in place, that’s when superior personalisation, loyalty and monetisation of customer data becomes second nature. As well as being good for customers, identity management greatly benefits the business itself. In terms of sales and marketing, more accurate targeting will improve your conversion rates; and you can gain the ability to add new marketing channels and capabilities - including multichannel marketing automation. In addition, digital transformation comes with huge opportunities for companies that want to grow. The latest identity solutions are cloud-based which means they work seamlessly across geographical boundaries, with the cloud allowing for almost infinite scale. But it no longer makes sense to invest in scaling a business without a strong identity solution. Digital transformation affects your internal systems. Growing numbers of people working remotely or from home need access to the same systems they access in the office. In some situations, the same systems need to be accessed by customers as well as employees. Identity and Access Management (IDAM) solutions are designed to give secure remote access to internally-facing systems from both sides of the firewall, making it an incredibly important foundation block of digital transformation. So, if you build your digital transformation right for your employees, you’re in a better position to offer access at scale to your customers. Similarly, a good foundation will enable you to offer customers 24/7 availability to online services in a global marketplace, where consumers shop, read and access systems at any time of day, from anywhere in the world. If you get identity right from the start, you will really get to enjoy the benefits the cloud offers in terms of scalability, availability and flexibility. The industries that are most successfully embedding identity at the core of their digital transformation programmes, and seeing the benefits, are retail and the media. These sectors are blazing a trail for multichannel identity management, gleaning data about their customers in the online and offline worlds, and combining it to target their customers accurately and appropriately. Industrial and automotive firms are also moving closer to the end customer, either via the existing supply chain or through direct opportunities that arise from today’s digital technology. An identity-centric stance will take them to the next level. Logistics firms also stand to improve their competitive edge by doing more with customer data and offering a highly-personalised service. Utilities, too, are seeing the advantages. Many are cottoning on to the power of customer data analysis, and see the sense of having a single customer identity management platform. Online fashion retailer ASOS is a great example of a company that used identity as the cornerstone of its digital transformation strategy and is now reaping the rewards. ASOS worked with Amido to create a global identity service for 20 million customers. As one of the world’s most successful online fashion retailer’s, ASOS has 98 million visitors a month, buying from 237 countries. However, the company identified difficulties during the checkout process which were affecting sales, particularly during registration and signing. By developing a new identity service based on cloud technology, it allows the solution to work with its existing systems and connect up its storefront to various social channels. This gave ASOS a single view of their customers, who are able to sign into the e-commerce site through Facebook, Twitter and Google+ from their device of choice, and share their experience across all platforms. The service also removed friction from the checkout process, reducing abandoned transactions and increasing conversions. Managing user identities and access to IT resources has never been more important as organisations increasingly turn to cloud services and mobile apps to empower mobility and scalability. Ensuring employees and customers can access applications and data from multiple devices and locations, without compromising security, is a cornerstone of digital transformation. Robust IDAM solutions make this achievable; and give you a foundation for secure and easy connections between your digital business and your customers: a system that can grow as your business grows. And you don’t need to rip out your IT system. Instead, you can use the cloud to put identity management at the centre of your business. As a result, it’s easier than ever before to make identity the cornerstone of your digital transformation.